In the 1960s, Stanford University psychologist Walter Mischel conducted an experiment that came to be known as ‘The Marshmallow Test’. Pre-school children were offered a choice: they could either have one marshmallow now, or two if they waited an agreed amount of time. The idea was to study willpower, and the ability to defer gratification. While the study proved interesting in the short term, it was only in the long run that its significance truly emerged, as the pre-schoolers grew up. By checking in with graduates of his experiment as the years went by, Mischel realised that performance in the Marshmallow was an astonishingly good predictor about future performance. Oh no, you might be thinking. I would totally have eaten the marshmallow, ergo I’m doomed. If that’s the case then a) you need to hold off on the dramatic conclusions, and b) don’t worry, because Mischel’s experiments didn’t stop there. He wanted to find out whether the methods the children who waited used to resist eating the marshmallow could be learned. Mischel tinkered with his experiment, seeing what could make a difference. He found that the marshmallow being in the room, within in reach, was far more tempting than simply a picture of a marshmallow, for example. He also found that making the kids think happy thoughts by giving them positive suggestions was highly effective in increasing their ability to wait. It boiled down to ‘hot’ vs ‘cool’ thought. If the child was told to think of the marshmallow as sweet, gooey and delicious (‘hot’ thoughts, focusing on the sensory experience of the marshmallow), they couldn’t wait to get their hands on it. If they were told to think of it as a fluffy white cloud (‘cool’ thoughts, focusing on abstract qualities), they could. The technical term for this is cognitive appraisal, which Mischel explains by quoting Hamlet: ‘There is nothing either bad or good, but thinking makes it so’. How we think about something determines our relationship to it – the trick is how to effect that change in thinking. Both response activate different parts of the brain. ‘Hot’ responses come from the limbic system, the oldest part of our brain – they correspond to what renowned sports psychologist Steven Peters calls our ‘Inner Chimp’ (and also, broadly speaking, Freud’s conception of the Id). ‘Cool’ thoughts come from the pre-frontal cortex, the most evolved part of our brain, responsible rational thought and long term planning. Each has an important role to play in our lives – the challenge is to get the right one activated at the right time. 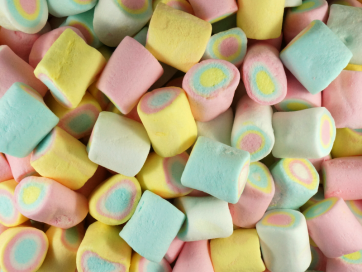 The idea that suggestion is a powerful tool for change comes as no surprise to any hypnotherapist – hypnosis, after all, is the science of suggestion – but The Marshmallow Tests provides a wonderful example of its application. While Mischel used non-hypnotic suggestions to vastly improve his subjects’ ability to defer gratification, the scope for using hypnotic suggestion to increase willpower is immense. Activating a ‘cool’ response cigarettes will clearly aid the smoker avoid the next cigarette, but equally, there are times when activating the ‘hot’ response can be useful too. Much assertiveness training, for example, encourages people to act on their emotions, rather than rationalising away instances of people riding roughshod over them. Our ability to plan for the future is one of our most useful traits, and the Marshmallow Test showed just how important our ability to defer pleasure can be. Knowing how we can override our less helpful impulses is clearly a great skill to acquire. However, it’s worth noting that a life spent eternally deferring gratification wouldn’t be much of a life at all, so as always, balance is key. Mischel, W., The Marshmallow Test, 2014, Penguin, London. Peters, S., The Chimp Paradox, 2012, Vermilion, London. Actually, the treats/rewards on offer varied, but the marshmallow became synonymous with this experiment.